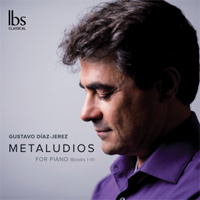 GUSTAVO DÍAZ-JEREZ (b.1970): Metaludios for Piano, Books I-III. Description: In this ongoing cycle of works, the composer-pianist has adopted a highly individual, and inventive, approach to the question of expanding the possibilities available to the piano, " ... a huge challenge, given the huge body of great works behind me." Rather than opting to write works in conventional forms, marked with his own stamp of originality (which many composers would regard as sufficient, and sufficiently challenging), Díaz-Jerez seems to be trying to explore as many avenues of originality as possible in this set of pieces. The results are remarkably accessible, given the extreme techniques employed in "the composer's workshop", which the composer explains or to which he alludes in his titles. This is an important disclaimer, as some of the methods and inspirations are very arcane and complex indeed; however, the music, while obviously very modern, doesn't sound that way, and is less forbidding than many serial works or those of the 'new complexity' school. The pieces run the gamut from expressive, eventful pieces played conventionally on the keyboard, with a good deal of virtuosity and pianistic novelty, to timbrally outlandish numbers using a wide array of extended techniques, 'preparation' of the piano (the final piece contains a performance direction presumably unique in the literature; "pick up neodymium magnet") and in three cases an electronic part that introduces material written in a scale that divides the octave into 13, the interaction of which with the scale of twelve semitones is ... unusual. Computer algorithms - some very obscure - are used to generate pitch material, as are sequences from number theory, quantum mechanics, fractal theory, spectral analysis and so on. But Soler, Couperin, Brahms and Radulescu also provide inspiration, as do various mythical beings, depicted with the full coloristic resources of the techniques described above. Gustavo Díaz-Jerez (piano).